Play Starburst Slot Online with 500 Free Spins! Starburst is a 96.1% Online Slot Game by NetEnt. Starburst is known for its sticky wild respins and win both-ways paylines. Starburst slot is simply one of the best online slots ever created. It has won countless awards and remains one of the most popular slots in the industry despite almost 10 years since it was launched. With 10p minimum bets, right to left and left to right pay lines and sticky wild respins this game may not have any bonus rounds but it is nevertheless jam-packed with action. So if you are you a slot player who prefers to avoid complicated bonuses and just enjoy the simple but captivating appearance? 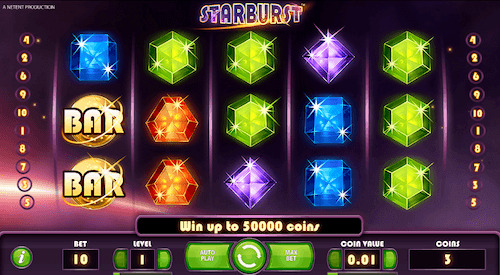 Here at Rose Slots we proudly present you probably the best game in history - Starburst by Net Ent. Starburst is a truly special online slot game that can be played on almost every device and browser including Android and IOS mobile phones. The vibrant and dazzling jewels, the colours and the opulence of the game make it one of the most famous slot games available today. Starburst has been developed by the NetEnt (Net Entertainment), which is one of the leading Swedish game developers. Starburst is NetEnt's number one slot game and is arguably the game that made it the market leader in developing slot games. Other top NetEnt slot games include Gonzo's Quest and Twin Spin. How do the sticky wilds on Starburst work? Sticky Wilds substitute for all symbols. They will enlarge to cover the entire reel and lock in place. If another sticky wild appears, then the first wilds will remain locked and you will have two full wild reels with another free resin. This can happen a 2nd time and trigger a third respin if another wild symbol lands. This in effect means that all 3 central reels turn wild, allowing for huge combination wins. One of the main reasons of Starburst’s popularity is the ease with which you can play the game. The gameplay is straightforward and it consists of 10 paylines with 5 reels and 3 rows. Another significance of Starburst slot Netent is that you can change the level and the bet value with each spin. Another such feature is the win-both-ways feature. The win-both-ways feature makes it possible for you with winning combinations from left to right AND right to left - this is a unique feature to this game as the vast majority of slot games only award wins from left to right like the below image shows. A key characteristic of the game that is worth mentioning is that you do not have to be an experienced player to play Starburst. This game is incredibly simple and easy to play and with a RTP of 96.1% is it also a potentially rewarding experience. The controls to Play Starburst on mobile are very simple and you can adjust the paylines with your mouse or finger if using a touch device. The autoplay button will help you make your spins, once you set a loss limit before spinning. Rose Slots has an amazing offer for starburst slot free spins, where all new players can claim up to 500 free spins when they signup and make a minimum £10 Deposit. This first deposit gives players the chance to spin the Mega Reel which can award up to 500 free spins on Starburst, Fluffy Favourites or other games. What are the best paying symbols in Starburst? The highest paying symbol is the BAR symbol which awards 250x the line bet for 5 adjacent symbols, 200x for 4 adjacent bar symbols and 50x for 3 adjacent symbols. The 2nd highest paying symbol in Starburst is the LUCKY 7 symbol which awards 120x for 5, 60x for 4 and 25x for 3 symbols. The worst symbol is the purple diamond which is also the most common symbol, which awards 25x, 10x and 5x bet multipliers. There are many UK casinos where you can play starburst slots UK but many of them do not offer such a great mobile experience with free spins offers on every £20 deposit. Rose Slots might be a new UK casino but it is also already one of the very best, with 9/10 players saying that they would recommend this online slots site to their friends. You can play starburst slot demo or you can play for real with exactly the same 96.1% RTP. Starburst Slot Machines do exist but they are rare and difficult to find, if you want to play our starburst slot tips then we recommend you login to RoseSlots.com, create an account and take advantage of the generous welcome offer. We are confident you will have an exciting experience full of rewards, trophies and achievements. Starburst is one of the top 4 games in 2018 on Rose Slots and we believe it will continue to be a player favourite for many years to come.